Once the root cause has been identified, the IT team must implement a resolution. Several options may be considered and evidence will be needed to quickly identify the solutions delivering significant improvements. SkyLIGHT PVX™ will monitor the performance path affecting end-user experience during network configuration changes and provide instant feedback on the impact of the steps taken by the IT team to mitigate performance issues. 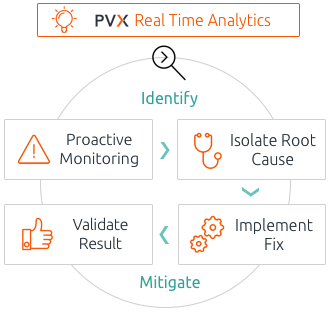 Once the appropriate method of remediation has been determined, SkyLIGHT PVX will generate reports on the actual performance of the network device or application instance and compare it to historical baselines, enabling IT teams to validate the effectiveness of the solution, close the case, and communicate efficiently. Now, it's time to see SkyLIGHT PVX in action!